1868 A Hand Illustrated Front from Sevenoaks to Tunbridge Wells depicting a pen and ink drawing of two "playing card suitors" vying for her attention? Franked by a 1d Rose-Red, SG 43, Plate 120, tied by a Sevenoaks duplex. 1887 A Hand Illustrated Front depicting a pen and ink drawing of a Policeman and Pickpocket! It is franked by a 1d Lilac, SG 172, tied by a London Hooded Circle. 1905 A beautiful Hand Illustrated Front from Paddington to Earls Court Road, London. 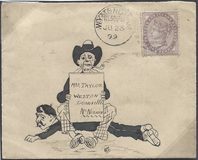 1899 Pen and Ink Hand Drawn envelope depicting a Pipe Smoker, sent from Wymondham to Loneville near Norwich. The artist, "H.T. ", has decorated the reverse with Prince of Wales Feathers and motto "Ich Dien". 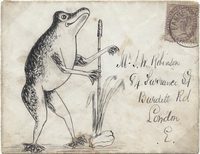 1884 A Hand-Illustrated envelope from Farnborough to London depicting, in pen and ink, a Frog/Toad? CIRCA 1841 VALENTINE ENVELOPE and Insert sent to Hyde Park, London. 1862 VALENTINE ENVELOPE and CARD SENT FROM YORK, 13TH FEBRUARY, TO "EDITH HARRISON, RUDD HALL, CATTERICK, YORKSHIRE" and "TO BE KEPT TILL HER RETURN FROM SCHOOL S.H.". 1877 A Hand-illustrated envelope addressed to Southampton, franked by a 1d Rose-Red, SG 43, Plate 199, tied by a very fine London W59 duplex. A finely executed illustration. 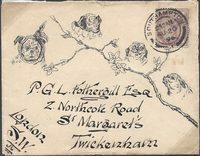 1902 A BEAUTIFULLY HAND-ILLUSTRATED envelope depicting Roses, from Johannesburg addressed to BATH, England, franked by a 1d Black & Carmine, SG 245, and tied by a superb Johannesburg cds. SUPERB. 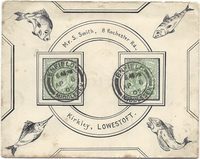 1905 Hand-Illustrated envelope from Enfield, Middlesex to Lowestoft, Suffolk, depicting four types of Fish, franked by two Ed VII ½d Green, SG 218, tied by very fine Enfield, Middlesex, cds. 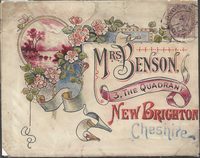 1892 1d Lilac, SG 172, tied to an ATTRACTIVE AND COLOURFUL HAND-ILLUSTRATED envelope from London addressed to New Brighton, Cheshire. 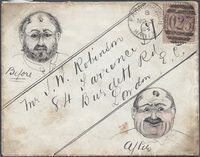 1884 1d Lilac, SG 172, tied to HAND ILLUSTRATED envelope to London by a fine Farnborough '023' duplex depicting a "Before" bearded gentleman and "After" clean-shaven gentleman. 1875 1d Rose-Red, SG 43, Plate 164, tied to a Pen and Ink Illustrated envelope from Liverpool to Trentham, Staffordshire. A few minor tone spots. 1902 Illustrated ½d Blue-Green Stationery envelope addressed to Cardiff with, on the reverse, an advertisement for "The Beetonette" Improved Portable Range, Carron Company, Carron Works, Carron [Falkirk]. 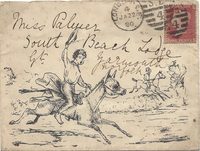 1906 Pen & Ink hand-illustrated envelope from Peterborough to Newport, Lincoln. Attractive. 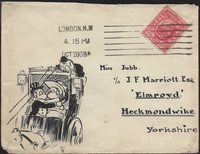 1908 Illustrated envelope from London to Heckmondwike, Yorkshire. Atttractive. 1915 1d Scarlet, SG 357 tied to hand-illustrated envelope from Tooting to Southend-on-Sea. 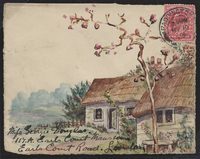 1880 Illustrated envelope from London to Yarmouth, Norfolk, franked by a 1d Rose-Red, SG 43, Plate 191, tied by a London duplex. Attractive. 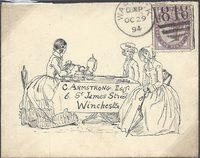 1894 1d Lilac, SG 172, tied to Illustrated Pen and Ink envelope depicting three ladies at tea; addressed to Winchester and tied by a Warwick 848 duplex. 1908 Type 5 MANCHESTER "POSTED IN ADVANCE FOR CHRISTMAS DAY" Columbia Machine cancellation on an attractive postcard addressed to Broughton Park, Manchester. 1892 MOORE'S ADVERTISING ENVELOPE. A fine envelope by Moore's Music Warehouse of Carnarvon, franked by a 1d Lilac, SG 172, tied by a CARNARVON DUPLEX. A Rare Welsh Advertising Envelope. 1896 1d Lilac, SG 172, tied to Pen and Ink Hand-Illustrated envelope to St Margaret's, Twickenham by a Southampton CDS. Illustration depicts Dogs' faces. 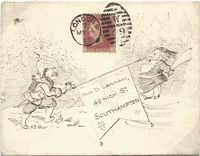 1889 Envelope franked by a 1d Lilac, SG 172, tied by a Stockport '733'duplex, and enclosing an interesting Christmas card depicting a crew of dogs rowing a boat - barking mad? 1890 Uniform Penny Postage Jubilee envelope by Harry Furness together with insert. Fine unused. 1837 Waybill for the Cross Keys Inn, Gracechurch Street, London advertising "Well-regulated 4-inside coaches" "to PARIS and to various towns in England...". 1838 Printed Waybill from the Castle & Falcon, Aldersgate Street, for the carriage of goods. 1911 First UK Aerial Post Envelope in Deep Brown flown from Hendon to Windsor, Box 2, Emergency Printing. Interesting letter of the time enclosed. Ex T. E. Field. 1911 First UK Aerial Postcard in Dark Green, Box 2, from WINDSOR TO LONDON, addressed to Wandsworth. SCARCE. 1911 First UK Aerial Postcard in Dark Green, Box 2, from WINDSOR to LONDON addressed to Datchet. SCARCE. 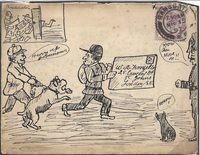 1897 Hand Illustrated Envelope from Ramsgate to London depicting a man and dog chasing the Postman presumably to encourage fast delivery? 1892 2½d, SG 201, tied to a "THOMAS CORBETT" Advertising envelope addressed to Holland by a very fine Shrewsbury '708' duplex. VERY ATTRACTIVE. 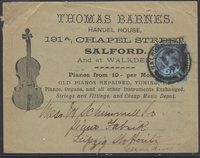 1899 "THOMAS BARNES, HANDEL HOUSE, SALFORD" Advertising envelope addressed to Leipzig, Germany, franked by a 2½d, SG 201 and tied by a Salford circular datestamp. 1896 1½d Yellow Postal Stationery Advertising envelope for "ALFRED SMITH & SON, BATH" addressed to Belgium, franked by an additional 1d Lilac, SG 172 and tied by a very fine Bath circular datestamp. A Victorian PEN AND INK VALENTINE ENVELOPE depicting a pretty girl and her admirer being serenaded by a musician sitting against a tree. Superb Unused.